"I am the Nightrider. I'm a fuel-injected suicide machine. I am the rocker, I am the roller, I am the out-of-controller! Ask the Toecutter who I am! I am the Nightrider!" I love Aussies. Seriously, though, Palm Sunday is upon us...hard to believe a year passed since my last trip to Spain, where right now an empty bottle of Manzanilla is slipping out of someone's hand into the gutter. Pretty soon the parades begin...but instead of celebrating my savior with alcohol, big dresses, dolls and plenty of dead bulls in Sevilla, I'm going to that New Jerusalem, LAS VEGAS, for Easter this year. Yikes! Hey, if it was good enough for my parents, it is good enough for me. Too bad I didn't put any hot Vegas money down on NCAA basketball. Only about three of you out there will give a damn, but this year I picked 6 of the "Elite Eight", ALL of the "Final Four", AND the two teams in the Finals, Ohio State and Florida (sorry, UCLA fans.) This is a personal best for me and makes up for my crappy showing in my Oscar picks. PS If I go all the way, Florida will beat Ohio State this evening. Well, fate and some "natural causes" conspired to keep my Spanish friends and me out of New York City last week, alas. They're back in their psychedelic-sacred homeland, and I took an afternoon jaunt up to San Francisco instead. Much as I love New York, there is nothing so sublime as lifting off from Oakland International as dusk, the plane curving up over the City, the red sea fog pushed up against the mountains. I must have done it dozens of times, by plane, train, car and bus, but for we Californians, cruising the length of the state is always educational. This time I was greeted by the long Santa Cruz pier, suddenly popping out of the fog, and then the swollen bulk of Salinas, which gets larger every year, all lit up except for a mysterious dark patch in the center (which somebody out there might explain to me.) I can usually pick out each town down the coast until the yellow glow of LA fills up the horizon...even a jet plane is insufficient to take in this monstrosity of a megalopolis; you'd need a spaceship for that view. I had another nice little flashback on Thursday, when some dumb tourists from Illinois lit a fire that burnt up the back of Mount Lee (where the HOLLYWOOD sign lives.) One of my earliest memories (I was about six) is of a fire in the same place, seen at night from the other side, Burbank, with everyone out in Hollywood Way watching the mountain burn up. Even so, these were both "good" fires, no buildings in danger, old brush burning up, with promises of "fire flowers" next spring (if we get any rain; we are on track to record the driest year EVER in LA.) Ironic, considering that two years ago we almost broke our WETTEST record. We have really fucked up our weather. Anyways, I took a nice walk over to Barnsdall Park and observed the fire from that hilltop. So much for the idle speculation. We are all suffering together...I also noticed that San Francisco has less rain than LA does in a normal year, and the desert had practically none, meaning no wildflowers this year (or lakes in Death Valley.) Them's the breaks. On with the SCREED. I also discovered that Eudora screwed up my St. Patrick's Day missive. I must, of course, resend the photo I took of the friendly "gorls" of Sligo, who were so excited to meet a real person from Hollywood. "Washington, Mar 24 :Oscar winning director Mel Gibson took to task a professor who was trying to create trouble for him during a meeting at Cal State University Northridge in SoCal's San Fernando Valley." A woman, while at the funeral of her own mother, met a fellow she did not know. She thought he was fascinating and fell in love with him there and then, but didn't d are to ask for his number and could not find him afterwards. A few days later she killed her sister. Sexpert Dr. Ruth Westheimer served as a sniper in Israel. Let's take a tangent momentarily; lately I've been engaged recently in several conversations regarding the "cutting edge" in archaeology, which is the Bronze Age, and wanted to distribute the appropriate links widely. Most of you know, natch, that outside the Muslim world a Dark Age took hold of Europe between 500 and 1300. Less known is the Dark Age between 1000 and 400 BCE. After the fifth century BCE (as you lucky ones who saw "300" can attest) the Greek city-states rose up, and along with them "Western Civilization", an unbroken line through Rome and the Catholic Church which persists to this day, as my friends in Sevilla know. Stonehenge Settlement Found: Builders' Homes, "Cult Houses"
This January 2007 news release explains how "a major prehistoric village has been unearthed near Stonehenge in southern England." The settlement is believed to be housing for the builders of the famous monument and a ceremonial site. Includes photos of the site, an animated map showing the site, and possible descriptions of worker homes and "cult homes" of chiefs or priests. Also includes links to related material. From National Geographic News. If I have an affinity for these ancient peoples, I think they may have been less barbaric and more sensible than the "classical" people who came later. After the Ice Age, there were few people and room to grow. More people = less resources, and then you have war, slavery, and a reduction of global trade. Eventually you get to our state, the world stretched to the limit. Just try getting from Santa Monica to Downtown LA at 3 PM. Just try. Remember to vote for that Goddamn high-speed train! Pondering these ancient worlds makes me despair for the stupidity of our own. Only a year and a half until we get to vote on a new President (and a HIGH SPEED TRAIN in California.) Well, at least we have good choices...at least four Democrats (Joe Biden, John Edwards, Bill Richardson and Christopher Dodd) who are superbly qualified for the job, not bad. Ooh, did I leave your favorite out? I dare you to ask me why. That's in case YOU or I get cancer, rather than Elizabeth Edwards. Official announcement from March 2007 about the passage of California SB 113, which "will move California's presidential primary to February, from its current June date." Includes a speech transcript, fact sheet, photos, and video clip of the signing. 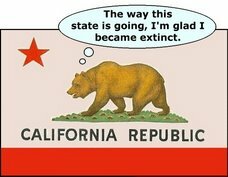 From the California Office of the Governor. E-mail reproduces various statements reportedly made by Hillary Clinton. I mean, how fucked up do you have to be? Worse than what German kids are up to? More bad news for libraries. According to THOMAS, the latest iteration of DOPA is b-a-a-ack. That's the bill that would require libraries with e-rate to block MySpace in libraries and schools. DOPA (Deleting Online Predators Act) is now part of S 49, Protecting Children in the 21st Century Act < http://thomas.loc.gov/cgi-bin/query/z?c110:S.49:> introduced by Senator Ted Stevens (R-AK) Jan. 4, 2007. It's now in referral to the Senate Committee on Commerce, Science, and Transportation. New postal law lets Bush peek through your mail. Collection of stories from October 2006 examining "the steady erosion of Americans' privacy, whether people are concerned and what impact other new technologies might have on your right to be left alone." Topics include technology (such as email and wireless video recorders), smart driver's licenses, comparison between U.S. and European laws, and celebrities and aggressive paparazzi. From MSNBC. Can't I just run away to Paris? La crise des "subprime mortgages" entraine-t-elle un risque systémique ? La hausse des taux de défaut sur les prêts immobiliers les plus risqués risque-t-elle d'ébranler la solidité du système financier américain et à terme l'économie des Etats-Unis ? Démontant les mécanismes du marché hypothécaire, Christian Parisot, économiste d'Aurel Leven, conclut que s'il existe un risque financier, le risque systémique doit être écarté. Pour lire cet article, cliquez ici . The US dollar bill's standing as the world's favourite form of cash is being usurped by the five-year-old euro. The value of euro notes in circulation is this month likely to exceed the value of circulating dollar notes, according to calculations by the Financial Times. Converted at Wednesday's exchange rates, the euro took the lead in October. The euro has displaced the US dollar as the world's pre-eminent currency in international bond markets, having outstripped the dollar-denominated market for the second year in a row. The data consolidate news last month that the value of euro notes in circulation had overtaken the dollar for the first time. Outstanding debt issued in the euro was worth the equivalent of $4,836bn at the end of 2006 compared with $3,892bn for the dollar, according to International Capital Market Association data. She was hoping the man would reappear at her sister's funeral. If you answered this correctly, you think like a psychopath. This was a test used by a noted American psychologist to see if one has the same mentality as a killer. Many arrested serial killers took part in the test and answered the question correctly. If you didn't answer the question correctly, good for you.